To Angie and Shane, church seemed to ask for a lot without giving much in return, and church like this didn’t seem worth the requirements involved. After they had their boys, Isaac (now 11) and Mitchell (now 9), Angie and Shane felt the need to go to church again for their kids’ sake. They tried several churches, but couldn’t seem to commit to going much. Then Angie went for a run on Losco Road near their home and saw that Access Church had moved into the neighborhood. Angie and Shane decided to try it out that Sunday. From their first visit, Angie and Shane enjoyed the music, the message, and the atmosphere at Access. “There were other churches the boys liked, but the difference was, this time we liked it, too,” Angie said. Access had an element that was key for Angie and Shane: they could check things out at their own pace with no pressure to commit to anything they weren’t ready for. This was not what they’d expected. Access was not church as they knew it. Going to church became much easier because it was enjoyable. Shane was not so sure about making this kind of commitment, at first. “I remember telling Angie that I would support her decision to serve as long as she did not ask me to do it,” he said. But Shane later joined Production Team, where he helps make Access Church a comfortable and fun environment so others can easily learn about God. 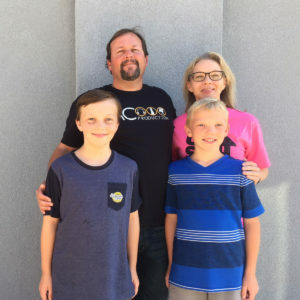 Recently Access celebrated our tenth anniversary with the tagline, “Changing the way you feel about church since 2007.” Thank you to Shane and Angie and all of our Access community who continue redefining the expectations of church so people can connect with God.